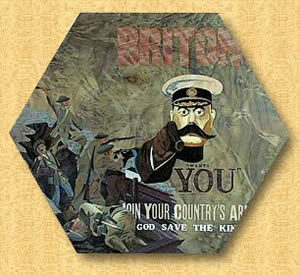 The 'war to end wars' was expected to last just a few weeks and was greeted enthusiastically by both sides. It started in August 1914 and ended in November 1918 and is now interpreted as a series of conflicts, with independent origins, which interlocked to result in "The Great War ". The picture depicts Lancastrian Henry Tudor being crowned Henry VII of England after defeating the Yorkist King Richard III at Bosworth Hill in 1458. This ended the era of the War of the Roses (Named after the badges of the two families involved). 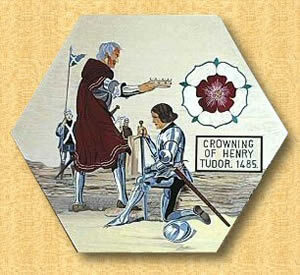 On marrying Elizabeth of York, King Henry VII combined the two families and their badges forming the Tudor Rose. 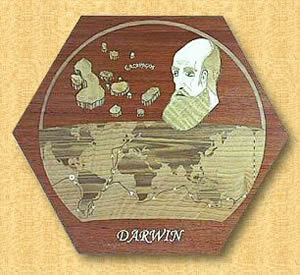 The plaque represents Darwin and the route taken by him in HMS Beagle. A stop at the Galapagos Islands proved to be instrumental in formulating his ideas when publishing in 1859 'The Origin of Species', and in 1871 'Descent of Man'. These papers proved controversial, as they contradicted the current teaching of the creation. His theories and ideas have helped us to a better understanding of our world as we enter the new millennium. 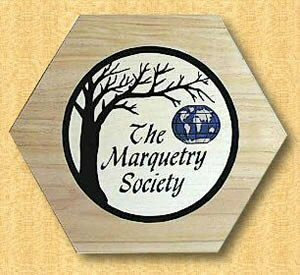 The Marquetry Society was founded in 1952 and is recognised as a leading authority on the craft of marquetry in all its aspects. It is a non-commercial organisation which exists solely to promote and encourage interest in this ancient craft. The Society has members in all parts of the British Isles and in many places abroard. The son of a Norfolk Clergyman,Horatio Nelson went to sea at the age of 12 and rose to become one of the greatest British naval commanders. He had conspicuous successes in naval battles at Aboukir Bay (1798), Copenhagen (1801) and destroyed the French Fleet at Trafalgar (1805), in which battle he died on board H.M.S. Victory. He is buried in St Paul's Cathedral. St Albans - P Lee. 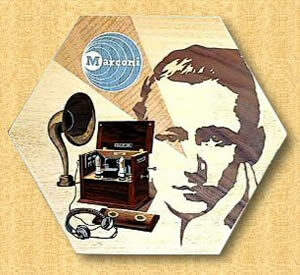 Guglielmo Marconi born in Bologna Italy on 25th April 1874, is justly regarded as the "Father of Wireless Telegraphy". From his first wireless transmissions in 1896 to the present day, his invention has expanded from a first transmission of 13/4 miles to not only sound but pictorial transmissions to and from outer space. On the right, Sir Winston Churchill (1874 - 1965) who was a soldier, writer and statesman and led Britain through World War II. He became Prime Minister in 1940. On the left, Adolf Hitler (1889 - 1945). He created the National Socialist (NAZI) Party. 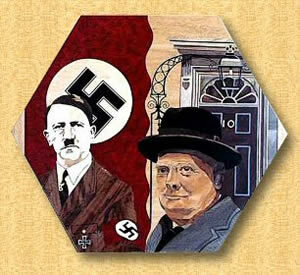 His aggressive policies led to the outbreak of World War II. 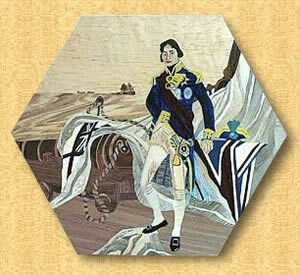 A tunnel was foreseen back in 1751 and confirmed as a project in 1802. Work commenced in 1881 and 1974 but was halted. 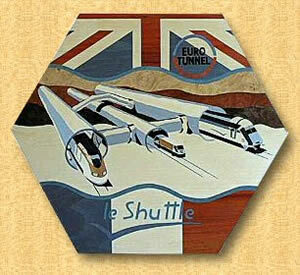 Finally the Channel Tunnel was started in 1986 and completed in 1994. It is 50 Km (31miles) long with an average depth of 45 metres below sea level. Great strides have been made in medicine over the last 1000 years, especially in the last 150 years. 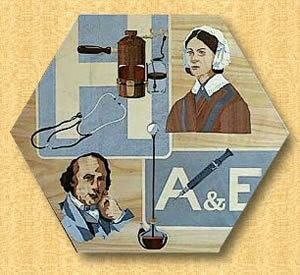 These saw British Joseph Lister (1827 - 1912) radically reduce the risk of infection by using antiseptics and sterilising instruments. Florence Nightingale (1827 - 1910) founded the first training school for nurses (1860) and radically improved the conditions for the casualties during the Crimean War. Isambard Kingdom Brunel (1806 - 1859) the son of Marc Isambard Brunel, was the Chief Engineer of the Great Weston, Britain and Easton steamships. Brunel's Clifton Suspension Bridge is 75 metres (246 feet) high with a main span of 192 metres (630 feet). Two main cables support the span. 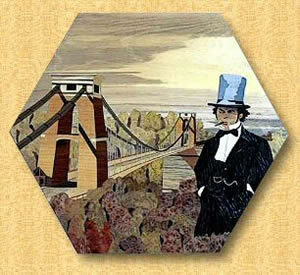 The bridge was completed in 1864 after Brunel's death.